Sho~Bud vinyl adhesive backed sticker to go on the left front (changer end) of the cabinet. Clip, Hair Pin, .042 Clip, Snap Ring, 1/4" Clip, Snap Ring, 5/16"
Hair Pin Clip used on some pedal steel guitars to retain the pull rod on the bellcrank. Snap Ring used primarily on Sho-Bud Pro I & II to retain round brass rod pull on 2 hole puller. Knee lever to fit various later models of Sho-Bud and Fender pedal steel guitars. Replacement for the die cast OEM reversing link. 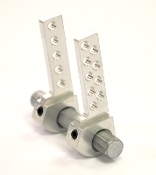 2 Hole rod pulls for early model Sho-Bud Pro I, Pro II, and LDG pedal steel guitars. 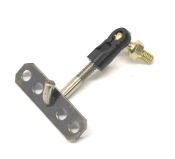 Pedal rod pull lever for Sho-Bud Pro-Series and Fender pedal steel guitars. 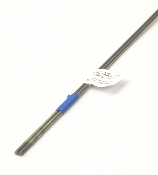 Replacement axel shaft for Sho-Bud pedal steel guitars. Brass rod swivel for Sho-Bud 2 hole pulls. Knee lever to fit various early models of Sho-Bud pedal steel guitars. Roller Nut replacement shaft for Sho-Bud Professional. Sho-Bud Finger Assembly for the Professional model.